When I learned about electronics in the past, trying to understand how circuit works by reading theories and practicing by building the circuit, the first one excited me was the flip-flop lamp circuit. The invention of this circuit might be rooted back to 1918, when William Eccles and F. W. Jordan build the first flip-flop circuit using vacuum tube, and it was initially called the Eccles–Jordan trigger . Let’s call it a “classic” since it usually presented in many old electronic books without mentioning who the inventor is. 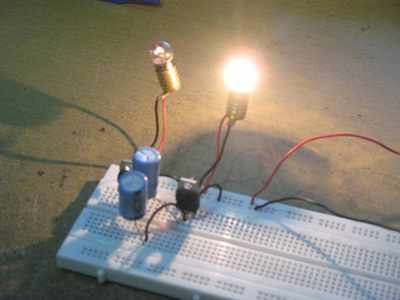 The circuit is very simple, it consist of two transistors, two incandescent bulbs, two resistors, and two capacitors. This circuit gives the impression of how automation can be done by electronics. Without all this automation stuffs, we have to operate switches to make flip-flop flashing lamps. Before vacuum tube or transistor era, we might find relays to achieve this, and before relay era then we might use heated bi-metal contact to make it. Thanks to the invention of transistor, a solid-state device, which make many things simpler and smaller. Let’s start with the schematic diagram of the circuit, see Figure 2. The resistor serves as the biasing circuit, connecting the current path from Vcc to the base of the transistor. The voltage across the resistor (VR) will be the Vcc minus the base-emitter voltage drop (VBE), which can be approximated as fixed value around 0.6-0.7V . The bias current is then computed as VR/VBE. The incandescent bulbs serve as the loads, connected to the collector of the transistor. This load also serve as current limiter to the transistor, so the current won’t burn the transistor by keeping under maximum current handling of the transistor. The current will flow from power supply (Vcc) to the lamp, and then enter the collector and return to the ground (-Vcc) through the emitter. The transistor here works like a switch since it will operate at saturated region, just like switched “on” (the collector is shorted to the emitter) or “off” (the collector is disconnected from the emitter). The voltage across the lamp will be the Vcc minus the collector-emitter voltage drop (VCE), which is very low (below 0.2V) when it is in saturated “on” condition. The capacitors, is connected as the feedback path from the “output” to the “input”. The output here is the collector, and the input is the base of the transistor. The simplest model (approximation) of a capacitor is that it looks like shorted (closed, fully connected) when empty, and it looks like open (disconnected) when fully charged. When first powered, both transistors are off and both capacitors add additional bias current to both transistors, accelerating the process of turning “on” the transistors. Note that the polarity of the capacitor is reversed, so the capacitor won’t be charged but it acts like shorted or leaks, the capacitor will conduct the current but kept empty. With this accelerated bias current, both transistor is then in racing condition to get “on” state, but they almost never reach the state at the same time, so one transistor will always win to get first. Let’s say that TR1 gets “on” first, now the collector is shorted to the ground, the lamp L1 get turned on. The negative electrode of capacitor C2 is now get grounded, shorting the bias current of TR2 and makes sure TR2 is kept “off” after loosing the race. At this state At this state, the capacitor C2 is slowly charged, and the the base of TR2 is gradually increased. After some point, the base voltage of TR2 will reach the activation voltage and turns the transistor TR2 “on”. This turning on of TR2 will flip the state, now the lamp L2 get shorted to ground and turned on. The empty C1 get connected to ground through TR2, switching off TR1 by shorting its bias to ground, and slowly charged until it reach TR1 activation voltage to switch the state again. You can watch this flip-flop action in our Youtube video channel below.